Professor Sergiu Rudeanu, the author of this eBook, is a well-known research mathematician, working in the foundations of mathematics and mathematical logic. In the 1960s he pioneered with P. L. Iănescu (Hammer) the use of Boolean methods in operational research (their book Boolean Methods in Operations Research and Related Areas, Springer, Berlin, 1968 was published in French by Dunod, Paris in 1970; it is still cited after more than 40 years since publication). His many papers in Boolean algebras, their generalisations and applications— undoubtedly, Professor Rudeanu’s main area of research—are complemented by some important books, including S. Rudeanu, Boolean Functions and Equations, North-Holland and Elsevier, Amsterdam, New York, 1974, V. Boicescu, A. Filipoiu, G. Georgescu, S. Rudeanu, Lukasiewicz-Moisil Algebras, North-Holland, Amsterdam, 1991, S. Rudeanu, Lattice Functions and Equations, Springer- Verlag, London, 2001, and R. Padmanabhan, S. Rudeanu, Axioms for Lattices and Boolean Algebras, World Scientific, NJ, 2008. Professor Rudeanu is also a highly appreciated lecturer who taught many generations of undergraduate and graduate students at the University of Bucharest. His lectures are crystal clear, well-organised and rigorous, but not intimidating; many of them have been collected in textbooks published, in Romanian, by the University of Bucharest Publishing Company. My wife Elena and myself fondly remember his lectures from decades ago: they influenced our careers in no single way. The eBook Sets and Ordered Structures presents, in Rudeanu’s classical style, basic methods and results of the theory of ordered sets as tools for various branches of mathematics. The important notions and concepts are first presented in a gentle, informal manner; then, more abstract or axiomatic versions follow. The author is enthusiastic about his subject and his passion is well transmitted to the reader. The eBook’s itinerary starts with elements of naive set theory followed by a sketch of axiomatic set theory and categories; they fix the “mathematical language” for the remainder of the eBook. The next chapter presents partially and totally ordered sets, including a discussion of the axiom of choice and wellordered sets. The next chapter deals with transfinite algebras, cardinal and ordinal numbers; the more abstract part presents von Neumann’s construction of ordinals. The chapter on lattice theory includes modular, distributive, Boolean and complete lattices, as well as closure operators and Galois connections; these tools will be used in the study of universal algebras. The next chapter discusses meet and join representations in a lattice, and then use them for set-theoretical embeddings and the topological duality for distributive lattices. The last chapter presents a few applications in algebra, topology, universal algebra, formal concept analysis, and mathematical logic. This eBook is an essential companion for mathematicians—students or professionals alike—computer scientists, and information-engineers. Its right place is on the iPad of the reader, who can read, browse, or annotate it. I hope that the reader will enjoy this eBook as much as I do. This eBook presents several basic methods and results of the theory of ordered sets which are currently used in various branches of mathematics. The first chapter includes, besides the usual introductory elements of set theory, a sketch of axiomatic set theory and of the theory of categories, which provides a useful language. Then the fundamentals of partially and totally ordered sets are presented, including a few properties equivalent to the axiom of choice and culminating with well-ordered sets. The next chapter deals with transfinite numbers and includes von Neumann’s construction of ordinals. An introduction to lattice theory presents modular, distributive, Boolean and complete lattices, as well as closure operators and Galois connections; these include tools which serve as prerequisites to universal algebra. Chapter 5 first deals with meet and join representations in a lattice, then comes back to the set-theoretical framework: set-theoretical embeddings and topological duality for distributive lattices. Chapter 6 sketches a few applications. It is hoped that this volume may serve as a textbook for undergraduate and graduate mathematics students, as well as a reference book for mathematicians working in fields different from set theory or algebra. 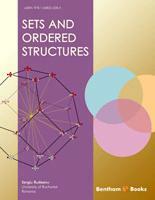 Perhaps a more appropriate title would have been “Sets and Ordered Structures for the Working Mathematician”. The interest of the eBook for an algebraist consists in implicit teaching suggestions. Chapter 1 begins with a quite informal sketch of the Zermelo-Fraenkel axiomatic system for set theory, having in mind the idea that although the axiomatic line will not be followed in the sequel, the mathematician working within the framework of naive set theory cannot be allowed to ignore the existence of foundations. The next section gathers in a systematic presentation the most frequently used properties of correspondences, relations and functions; thus e.g. each of the concepts of injection, surjection and bijection is characterized by 6-8 equivalent conditions. Categories and functors are then introduced; although the book is not directed towards category theory, a few categorical ideas and facts will be explicitly illustrated within the concrete categories which constitute the object of this book. On the other hand, the book will sometimes gain in rigour and conciseness by making use of the categorical language, e.g. in the sections devoted to duality for posets and to the algebraic and order-theoretical aspects of lattices and representation theory. Chapters 2 and 3 are devoted to those concepts and properties related to ordered sets which are of current use throughout the whole mathematics. The systematization offered here includes the complete existential theory of the distinguished elements which a partially ordered set may possess: least/greatest element, minimal/maximal elements, g.l.b./l.u.b. (i.e., the determination of all logical implications between these concepts). The general study of partially ordered sets, or posets for short, is then successively specialized to chains, or totally ordered sets, and well-ordered sets. Ordinals are introduced after as many of their properties as possible have been proved within the more elementary framework of well-ordered sets. The theory of ordinals and cardinals is based on the axiom stating that an abstract entity can be associated with each class of isomorphic well-ordered sets, such that to distinct classes correspond distinct entities. However in the end of chapter 3 we present von Neumann’s construction, in which every ordinal is obtained as the set of all lower ordinals. Chapters 4 and 5 study a few topics from lattice theory, which is another specialization of the idea of order. The selection has been guided by the following three aims: to construct lattice-theoretical tools broadly used in various branches of mathematics, to sketch the lattice-theoretical background necessary to universal algebra, and to build up the representation theory for certain classes of lattices (and even of posets), thus returning, in a certain sense, to the purely set-theoretical framework. The presentation starts with semilattices, according to a general tendency of this eBook, namely to establish the results under no more hypotheses than are actually needed, whenever this does not complicate the proofs. Then lattices, modular and distributive lattices, Boolean algebras and complete lattices (in particular, compactly generated lattices) are successively studied. Closure operators and Galois connections are also investigated, in view of their numerous applications. Filters and ideals are studied both for their own interest and due to their rˆole in the representation theory of various types of posets and lattices. Under the general heading of representation are included, on the one hand, meet and join decompositions of elements in certain types of lattices, and on the other hand, set-theoretical embeddings for various types of posets and lattices, as well as the duality theory for distributive lattices with 0 and 1, in the general setting of H.A. Priestley. Chapters 1-5 represent our selection of the fundamentals of ordered sets used in mathematics, while Chapter 6 actually sketches several applications. Many examples and exercises are included. The book is self-contained with the slight exception of certain examples taken from other fields of mathematics. The bibliography contains items which we recommend to the reader desirous to have a deeper insight of the various topics presented in this eBook. I began to write a draft of this eBook while I was a visiting professor at the University of Oran, Algeria, where I found excellent working conditions. Then I experimented in my courses at the University of Bucharest, with good results, several teaching ideas now included in the eBook.